Over the course of the last year, millions of Americans voted for Bernie Sanders, a democratic socialist candidate who offered a program of radical change. According to public opinion polls, nearly all of them are now going to cast their votes for Hillary Clinton. They will do so even though she remains a widely disliked and untrusted candidate who is often seen as being the candidate of the “Establishment”. Some polls put the number of former Sanders supporters now backing Clinton as high as 90%. Most expect the numbers to be even higher as the November election draws closer. Clinton has gone from being the candidate of Goldman Sachs and the one-percent to being the candidate we will vote for. The first is that the fear of Donald Trump winning the election has persuaded many of us that any alternative would be preferable. In that sense, many on the American left are echoing the decision by French socialists in 2002 to support the hated Jacques Chirac rather than to allow Jean-Marie Le Pen to win the presidency. The second is that a full year of the Sanders campaign actually had an impact. This is true even though the candidate fell short of the number of delegates required to win the nomination of his party. Take the Democratic Party’s platform, which revealed how far to the left the party has turned. Sanders himself was the first to point this out. In every speech he gives – including his address on the opening night of the Democratic National Convention in Philadelphia – he emphasizes how many of his ideas made it into the final program of the party. There are counter-arguments to both of these points. But those arguments are gaining little ground among Sanders supporters. One of those argued that choosing Clinton over Trump is a form of “lesser-evilism.” At some point, one simply has to say “no” and vote for a candidate who is not seen as evil at all, such as the Green Party’s Jill Stein. Another argument is that all of the Democratic Party’s concessions to Sanders are meaningless. No Democratic politician is obligated to do what the party platform says, including Hillary Clinton. 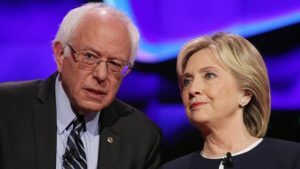 Though Clinton has publicly embraced many of Sanders’ positions in recent weeks, there’s no reason to believe she’ll carry any of it out once elected. There is little evidence that either of those arguments have had much of an impact on Sanders supporters. They certainly haven’t persuaded me. It was a good slogan that expresses the view of many regarding Hillary Clinton today. The argument that Clinton doesn’t really believe in the $15 an hour minimum wage, or single-payer health care, or debt-free college tuition (among many Sanders positions she has adopted in recent weeks) misses the point. The left understands that its job when someone wins the presidency on a left-liberal platform is to mobilize to ensure that they live up to their promises. This is why the civil rights movement came alive in the 1960s. This is why the great March on Washington in 1963 came about to pressure a liberal Democratic administration to live up to its promises. Such protests would have had little impact if the Republican Richard Nixon had won the 1960 election. But the Kennedy-Johnson administration was vulnerable to pressure, and the result was the Voting Rights Act, Medicare, Medicaid, Food stamps, the abortive “war on poverty”, various civil rights laws, and more. If Clinton wins the election on November 8th, all those millions of Sanders supporters who grudgingly voted for her, will need to be mobilized to force her and Congress to enact as much of the Democratic Platform as we can. Sanders has launched a new organization, “Our Revolution”, which is devoted to precisely that. As for Donald Trump, there is a tendency among some on the left to say that while he’s bad, he’s really no different from Clinton. In some ways, some have said, he’s better. He opposed job-destroying “free trade” deals like TPP and NAFTA, and he’s seen (by some) as being less likely to lead the US into pointless wars in the Middle East. Such a view of Trump is delusional. Trump is a racist, sexist, and right-wing bully who is America’s Jean-Marie Le Pen. There is more than a whiff of fascism in his campaign. To not see the differences between him and Hillary Clinton is to be blind. Fortunately, if the polls are right, the vast majority of Sanders supporters understand this. Given a choice between Hillary Clinton, who has been forced against her will to run on the most progressive platform the Democrats ever had, and Donald Trump, most liberals and leftists know what needs to be done. This article appears in the current issue of Solidarity. 2 Comments on "Why Sanders and his supporters are now backing Clinton"
I find I agree with your analysis more now than when there was still a chance that the Sanders-led movement might continue into the election. But what I find distressing in the above is not the analysis as much as the lack of any mention of an organized section of the Democratic Party (or a third party) flowing from the Sanders campaign. If that’s not developing then this whole thing has been a short-lived protest with no legs and it will fade.